Polish Pottery Butter Dish. 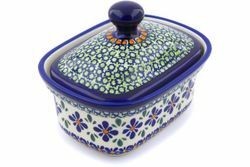 Get this unique polish pottery butter dish with lid. Our Polish pottery butter dish is made of nonporous stoneware. The hand-painted surface is scratch resistant and easy to clean. The beautiful, high-gloss finish makes this butter dish a great presentation. Use it for butter or as a holder for your tea bags.